Poultry Housing - Poultry Matters Suppliers of poultry,ducks and geese. -We have managed to find a company that makes hen houses just the way we like them made.These houses are constructed from 12mm deep rebate shiplap cladding that is dip treated during construction in a nut coloured preservative.This makes sure that the wood treatment gets into all the nooks and crannies. The roofs are clad with "onduline" which are bitumen saturated, organic fibre corrugated sheets.This is ideal for poultry housing as it doesn't provide a haven for the dreaded red mite,unlike the traditional felt roofs. All the roofs are hinged,except those with built-in entrance doors.This makes the weekly clean- out much quicker and easier. Many of the houses have slide out floors which also helps no end with cleaning. There are perches fitted in all the units as well as pop holes with vertical sliding doors.All the houses come with solid floors and the mesh used for ventilation slits and on the runs is 25mm square, 16 guage which is very strong. Access into the external nest boxes is via the hinged lid which we feel is less intrusive to the birds than front access.These lids are now made from recycled plastic which makes them much more durable and 100% waterproof.The nest box lids and any hinged roofs have special catches for extra security. We have tried to provide as much information about the houses available but if there is anything more you would like to know then please get in touch. Please be very careful when choosing your poultry housing as many available on the internet are of very poor design and quality. You can come and have look at our houses and see for yourself the high quality of build and the attention to detail in their design. 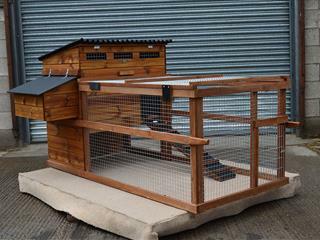 This new up-graded model will house up to 5 birds.It has a hinged roof and slide out floor.Price includes external nest box and carry handles. Optional Extra: Free standing run 6' x 3' - £94.00 L6'xW3'xh25"
The Stafford comes in three sizes.Hinged roof,slide out floor and external nest boxes all come as standard as well as the ramp to the pop hole.It is raised 15" from the ground.Shown here are the Standard and the Major. Traditional House for poultry, ducks or geese with door entry. For larger flocks of poultry,geese or turkeys.Available in two sizes with hinged entrance door and external nest boxes.Also variable ventilation slits. Unit Size: 72" x 72" x 60"
This is a raised house with slide out droppings tray and external nest box as standard.The underside of the house provides a weather proof area which can be used as a feed station or as shelter for the birds.This is acheived by the provision of a fixed rear panel and a removable side panel.It comes in three sizes. Unit Size : w37" x d32" x 54"high. Very popular poultry house and run unit for use where it is necessary to contain stock, for example pure breeds or for use in the garden. One piece removable run top. Run top also slides away from house to access pop hole or add feed/water and locks in the closed position. This price includes external nest box and end release and transport wheels. 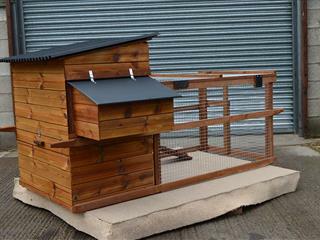 A raised poultry house with integral run suitable for up to 4 birds. An external nestbox, slide out floor and end release gate are all standard features. A ramp leads to the pop hole entrance with a vertical sliding cover held open by a hook and eye. This design allows the birds to use the whole footprint of the "Dovedale" with a weather protected area under the house giving both shelter and shade to the occupants. The run top is removable or will slid away from the house to open and close the pop hole or attend to feed and water. Handles are fitted to both ends for ease of moving. Length 198cm/78", Width 81cm/33", Height 114cm/45"
This superb unit has a built in covered feed station at the end of the run.The area is slatted so any spilt food can drop between them .This stops the birds eating any stale or dirty food.It comes with an end release fitted to allow the birds to free range on occasion.Price also includes external nest box and slide out floor. House size w42" x d33"
Grosvenor Standard up to 12 - has a 72" run attached with carry handles. An external nest box with two compartments provides roomy laying space. A hinged lid allows easy egg collection. There is a slide-out floor / droppings tray to make cleaning out an easy task. A lift off panel gives access to the house. There is a hinged door to access the run area. A vertically sliding pop hole gives birds access to run area. The end panel under the house rotates 180 degrees and is designed to take a feed hopper (see below). This feature allows easy access / filling of hopper and weather protection when closed. There is a removable panel at the end of the run.To allow your hens free range or to add an extension run. You can order via email or phone. Payment ,when ordering ,can be made in cash in person, by cheque or through PayPal. All the houses and runs come flat packed ,so are easily transported.You can collect but if you prefer we can deliver and erect them for you.There will be a small charge for this.If this is something you would like us to do please ask for details. If we do not have the house you require in stock there will be a short wait while it is made for you. It shouldn't be longer than 3 to 4 weeks.